Education for Sustainable Development (ESD) offers a still underused potential to contribute to the transformation away from un-sustainability. 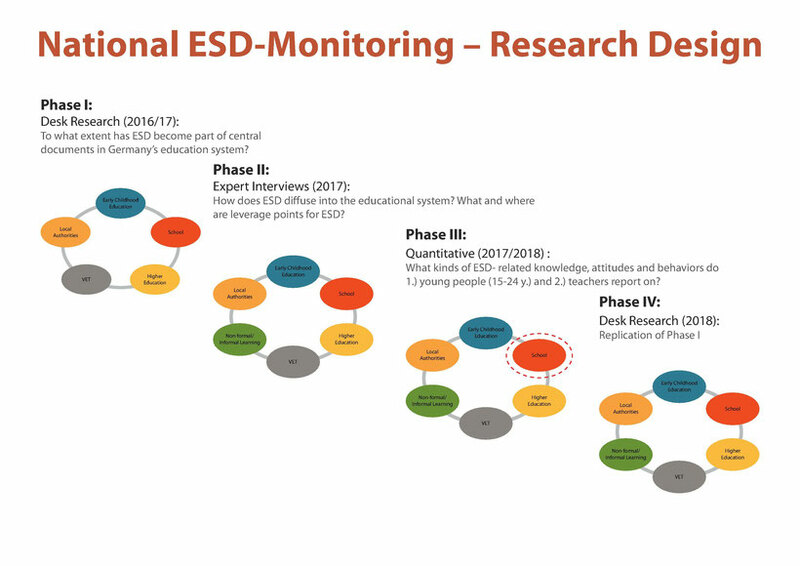 The encompassing national monitoring process of ESD in Germany offers insights into effective ways of reaching the international goal of mainstreaming ESD. Education is seen as decisive in supporting current and future generations in tackling the enormous sustainability-related challenges of the current times. Therefore, the relevance of ESD has been emphasized by various top-down and bottom-up-processes: A UN-Decade (2005-2014) was devoted to it, followed by a UNESCO-Global Action Programme (GAP) on ESD (2015-2019) while the aims are the implementation of ESD at all educational levels and in all nations. The GAP roadmap states that "ESD empowers learners to take informed decisions and responsible actions for environmental integrity, economic viability and a just society, for present and future generations, while respecting cultural diversity. […] It achieves its purpose by transforming society" (UNESCO 2014: 12). Also, SDG 4.7 aims at ESD as one critical part of quality education for all while many other SDGs are fostered by increased levels of good education (Nilsson et al. 2016). In summer 2016, a National Action Plan on ESD in Germany resulted from a participatory process led by the Ministry of Education and Research while the German Bundestag supported this plan in September 2017. At the same time, young adults request more sustainability-topics from educational systems (e.g. netzwerk n e.V. et al. 2017). The results of the desk research show clearly that, at the level of key documents within the German educational system, EDS has been taken up to some extent, but varies highly with regard to fields of education, subjects, federal states, and how recent the documents are (more ESD in more recent documents). Taking the example of schools, the integration of ESD within the formal structures of the German educational system shows, that the more the documents are of obligatory nature (e.g. curricula, common national educational standards), the less ESD is implemented. Furthermore, an expected challenge for an ESD-mainstreaming is an integration beyond the subjects with the highest overlaps with ESD-topics (such as Geography, Biology or Social Studies) into the obligatory subjects with more teaching time. The first results of the expert interviews on identifying leverage points for mainstreaming ESD in the different educational sectors show that the complexity of ESD is a hindrance for effectively catalyzing the diffusion of ESD as an overarching and cross-cutting ‘social innovation’ within the educational system. Also, there lies a potential for ESD- mainstreaming in turning a view on other cross-curricular topics such as inclusion, digitalization or gender mainstreamin as competing with ESD into a more constructive and synergistic relation. Many experts also emphasize the importance for quality ESD-related training for multipliers such as teachers, lecturers, educators, which is one priority area of the UNESCO GAP on ESD and the National Action Programme on ESD. Here, new capacities and structures would need to be created to leverage the training of the trainers for ESD. The first results of the monitoring point to the still great potential of further integrating ESD in broad (cross-curricula and following a whole-institution-approach) as well as deep (high quality-ESD including innovative methods, conveying heuristic instead of epistemic knowledge participative, problem- centered learning etc.) ways into the educational systems. A deep, cross-sectoral and ambitious implementation of ESD has a huge potential for contributing to a successful societal transformation and overcoming the current un-sustainability because ESD equips people with the capability for shaping the world in a responsible and informed way. Here, ESD also functions as a driver for and vehicle of the variety of sustainability topics discussed in future earth contexts. Given the inertia of structural innovations within the educational system, however, implementing ESD has the tendency to be a crucial, but a rather ponderous leverage point for a great transformation. The upcoming analyses will complement the findings so far and include insights from the representative survey concerning the extent and quality of ESD in educational settings and a replication of the document analysis to observe trends of the ESD-Implementation. Nilsson, M., Grigg, D., Visbeck, M. (2016) Map the Interactions between Sustainable Development Goals. Nature, no. 534, pp. 320-322.